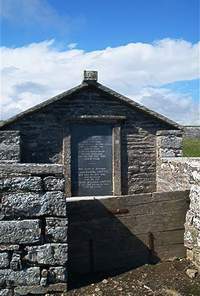 Erected by Daniel Louttit in memory of his wife. Jane Copland died at Norland Cottage Lybster 29th June 1872 aged 70. Son Jessie Copland died 25th June 1883 aged 87. Here also is interred the said. Daniel Louttit died 5th November 1885 aged 84. Son Charles William Louttit died 30th November 1930 aged 86.